It’s hard to believe that the minor league seasons are reaching their second half and the Twins have had some strong performances throughout the system. As we approach the 4th of July, it’s again time to celebrate with some awards. Tonight, we start our series of Twins Daily Minor League Monthly awards by looking at the top relief pitchers in the Twins system during the month of June. June 2018: Well, just keep reading (if you happened to not look at the graphic that you clicked on to read this story. Before we share our choices for the Twins Minor League Top Five Relievers for June, here are some terrific bullpen performances that just missed the cut. The Twins 35th round draft pick in 2016 out of Westmont College had a real solid month with the Miracle in June. After a breakout 2017 season in Cedar Rapids in which he posted a 1.13 ERA and 17 saves, 2018 has had some ups and downs. However, he now has a 3.18 in 39 2/3 innings. Opponents hit just .240/.283/.340 (623) off of him in June. Rodriguez was the second-round pick of the Los Angeles Dodgers in 2012. Later that season, he made his big league debut and stayed in the big leagues through the 2015 season. Unfortunately, he fought several injuries. Fast-forward to this year, and after the season started, the Twins signed him as a free agent. Soon after, he spent a couple of weeks with the Miracle before moving up to Chattanooga in late May. The southpaw had a strong month for the Lookouts. Opponents hit just .206/.300/.294 (.594) off of the 27-year-old during the month. Busenitz wasn’t as good in June as he was in April and May, but he was still quite good. While fans wanted him up soon, he did get called back up with a week left in June, though he was again optioned before the month’s end. Opponents hit just .228/.241/.333 (.575) off of him. Most impressive was 13 strikeouts and zero walks. Despite his 6.43 ERA with the Twins this year, he has a 12-2 strikeout to walk ratio. Vasquez represented the Twins and the Miracle in the Florida State League All-Star game in June and threw a scoreless inning (if you want to add that to his above stats). As you can see, there are times that Vasquez can struggle with control, but he limits hits by utilizing a tremendous slider that can miss a lot of bats. Like Lujan, Vasquez was drafted out of Westmont College in 2016 in the 32nd round. Following the All-Star break, he was promoted to Chattanooga. He’s made two appearances and has 10 strikeouts in 4 1/3 innings. Moran was the Twins seventh-round draft pick in 2015 out of high school in Puerto Rico. He missed the 2016 season after having surgery to remove bone spurs from his elbow. He returned strong in 2017, and he was the Twins Daily short-season Minor League Pitcher of the Year. For Elizabethton, he gave up just one run in 24 2/3 innings (0.36 ERA), and had just six walks to go with 45 strikeouts. Moran began the 2018 season in Cedar Rapids. He struggled with his control in April when he had 12 walks and 12 strikeouts in just 7 1/3 innings for the Kernels. Since then, he has been much improved. In May, he had 26 strikeouts and seven walks in 18 innings. As you see above, he had 23 strikeouts and seven walks in 15 innings. Still not great control, but his swing-and-miss stuff make the walks more bearable. Moran is not a big guy .He stands 6-foot-1 and weighs in at about 170 pounds. He’s got a good whip-like action and some deception in his delivery. His fastball reaches into the low-90s, and he’s got a good slider and changeup. He really just needs to keep working and developing, and gaining strength could help him add a little more velocity. He’s a really good athlete who fields the position well. There were several strong relief pitcher performances in June throughout the Twins minor league system. 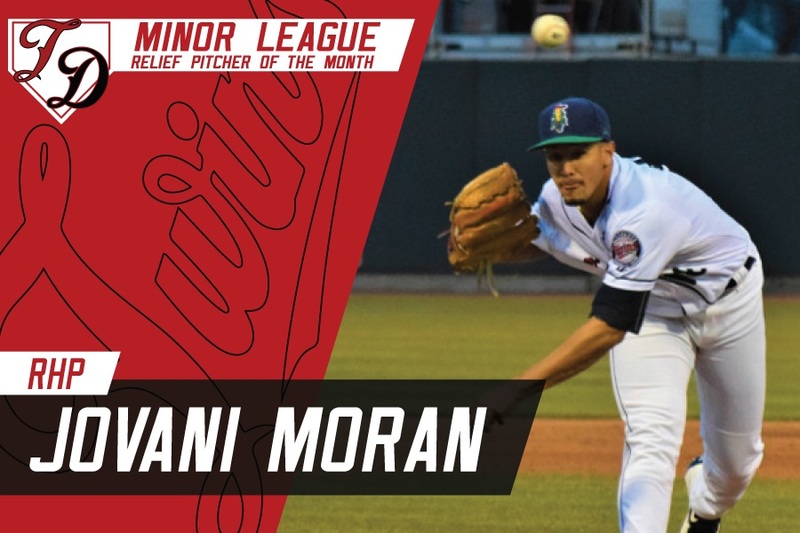 It was a good month for each of these pitchers mentioned today, but again, congratulations to the Twins Daily Minor League Relief Pitcher of the Month for June 2018, Jovani Moran of the Cedar Rapids Kernels. Okay - then bring them up.I do not think that relief pitchers need to go through as much minor league seasoning.If they have a live arm they are more likely to get worse than get better with excessive use. Have been excited about Moran for over a year.Hopefully, he can move up the ladder quickly and be part of a future bullpen for the Twins. If the Twins are going to win a World Series early in the 2020's, they are going to need three top short relievers to pitch from the 7th inning on.I doubt those pitchers are on the current team.So they are either going to have to come from free agency, trades or the current minor league system. Are any, or all three of those relievers pitching down on the farm today?Could any of this month's top 8 be one of them?Expect we are going to have to wait to see, but am curious about your thoughts, Seth. So, a team like the LA Dodgers, a team in the 2012 playoff hunt can bring up a 21 year old 2nd round draft pick to the major league roster in their draft year?Then as a 22 year old they can count on him to be a set up man with 76 appearances? It seems the Twins philosophy is the keep them in the minors until the get Tommy John surgery thus reducing any trade value, then stick them on the 40 man and keep them in the minors. Rinse and Repeat.